In 132 days, Toy Story Land will open to guests at Disney's Hollywood Studios. The announcement was made on ABC's Good Morning America Friday--and it came with special in-studio appearances from Toy Story characters Buzz Lightyear, Jessie, Slinky Dog and Woody. Starting June 30, the 11-acre expansion will allow guests to "shrink" to the size of a toy. 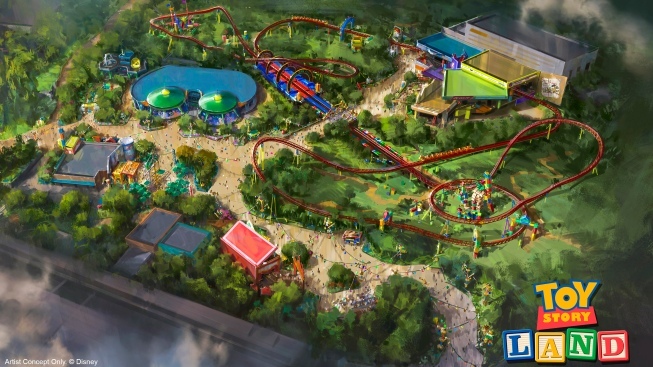 Decorated with gigantic Crayons, Cooties, Green Army Men, Rubik's Cubes, Tinkertoys and other childhood toys, the area will include an Alien Swirling Saucers ride, a Slinky Dog Dash rollercoaster and an expanded version of 3D-shooting ride Toy Story Mania with three tracks. Woody's Lunch Box, meanwhile, "will serve up tasty meals and old-fashioned soda floats" from a walk-up window, a spokesperson for the Florida theme park said in a statement. Plans for the Toy Story Land expansion were first announced in 2015 at the D23 Expo. As anticipation mounted, Disney unveiled the first attraction vehicle for Slinky Dog Dash last year. Versions of Toy Story Land already exist in other locations, such as Hong Kong and Paris. Shanghai Disneyland will open its own iteration of the movie-themed area on Apr. 16, 2018.